Despite the July lull in liturgical activities, the month has sped by for me, much as did June. 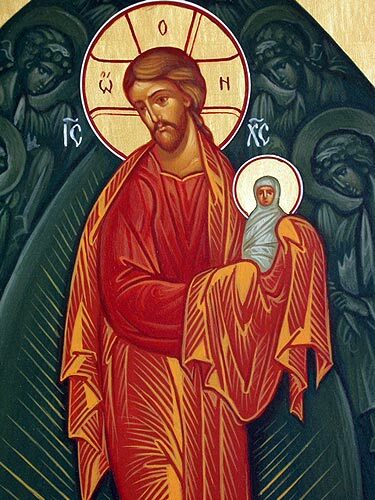 Now we approach the feasts of Transfiguration and Dormition: the former revealing the Divinity of Christ to His intimate disciples, and the latter commemorating the translation from death to life of the Most Holy Theotokos. Thematically, the two feasts are connected. The Transfiguration reveals Christ’s glory that He had from the beginning with the Father, as far as his disciples were able to bear it. The Dormition focuses on the glory that awaits us and is personified in the Dormition of the Mother of God. That they all may be one; as thou, Father, art in me, and I in thee, that they also may be one in us: that the world may believe that thou hast sent me. And the glory which thou gavest me I have given them; that they may be one, even as we are one: I in them, and thou in me, that they may be made perfect in one; and that the world may know that thou hast sent me, and hast loved them, as thou hast loved me. Father, I will that they also, whom thou hast given me, be with me where I am; that they may behold my glory, which thou hast given me: for thou lovedst me before the foundation of the world. God has manifested His presence in our midst at the Transfiguration of His Son, as the God-Man Jesus Christ, and calls us to share in that same glory at our departure from this world. In the span of nine short days, we literally go from “glory unto glory” in festal celebration: The same glory revealed on Mount Tabor prefigures the glory that shall be ours in Christ’s kingdom when we fall asleep in the Lord. That is, the mystery which has been hidden from the past ages and generations, but has now been manifested to His saints, to whom God willed to make known what is the riches of the glory of this mystery among the Gentiles, which is Christ in you, the hope of glory. We proclaim Him, admonishing every man and teaching every man with all wisdom, so that we may present every man complete in Christ.